to celebrate the Christmas holiday. Our regular hours resume on Monday the 26th from 9am-7pm. Our regular hours will resume on Monday the 2nd from 9am-7pm. 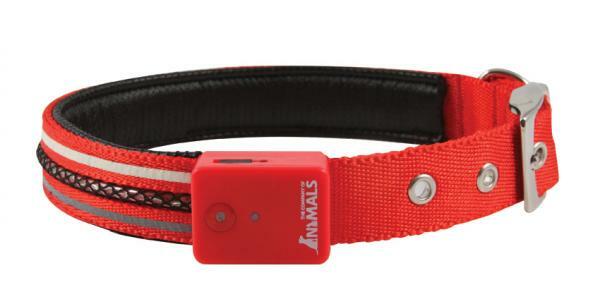 VIVID™ is a fantastic illuminating safety collar, designed to keep your dog safe and visible at night. The super-bright white LED’s have four light settings; a unique light-sensitive mode, (automatically coming on when dark), slow-flashing, quick-flashing and permanently on. The tough, strong padded design with secure metal buckle means that the VIVID™ collar can be worn all the time. Being water-resistant makes it perfect for all weather. The VIVID™ collar is simple to power, either re-charge direct into the mains or via a USB giving up to 15 hours continuous use. No batteries required and visibility is up to 1000ft. We admit it—we’re overindulging in holiday goodies! With all the treats around at this time of year it’s difficult not to overdo it and the same thing can happen with our pets! Below is a great article by Dr. Melissa Shelton that talks about the essential oil Di-Gize (by Young Living) to help ease our tummy aches no matter what the cause. Along with the Di-Gize Dr. Shelton recommends, to help ease your pooch’s tummy aches we also recommend canned pumpkin, coconut oil and a digestive enzyme. The Perfect Form by Honest Kitchen is another great option for any kind of dietary upset. Di-Gize is an essential oil blend which is incredibly helpful for any gastrointestinal upset. (For both humans AND animals! )Whether the flu or food poisoning, if you do happen to get sick here are a few tips to help you to speed through the unpleasantness. Di-Gize is an essential oil blend which is incredibly helpful for any gastrointestinal upset. From nausea to diarrhea to heartburn - a drop or two rubbed onto your belly, placed into your belly button, or rubbed onto your feet - delivers relief. Animals can be “pet” with a light coating of this oil on your hands, and receive the same benefits - including help with car sickness. When you “know” you might have to vomit - but it just isn’t quite happening yet… Filling an empty gel capsule with DiGize and swallowing it down - will either make you feel better or purge whatever has to come up - UP and OUT! Peppermint oil can be dripped into the belly button or rubbed onto the bottoms of your feet to help relieve fevers, nausea, headaches, and more. Every essential oil can boost your immune system - however when our family feels like we are starting to “go down” - we often reach for a Raindrop Technique application of oils or ImmuPower essential oil blend. By using these oils - we have averted certain illness many times. You can find many past newsletter articles on using oils at www.OilyVet.com or follow this link to a newsletter on the basics of using essential oils. This year, Hanukkah starts on December 20 at sundown. Here’s a traditional recipe, adapted for dogs. Two small latkes will make your pup feel he is part of the fun. Treats in moderation are the spice of life! Mmmm, latkes for everyone!Combine 4 cubed sweet potatoes, 2 eggs, 2 tbsp all-purpose flour, and 1 tsp baking powder, and pulse in a blender until thoroughly mixed. Heat 1/4 cup canola oil in a skillet over medium heat. Scoop up about 1/3 cup of the mixture and shape into a patty. Fry each latke for 2 to 3 minutes per side until brown and crisp, adding more oil as needed. Dab the latkes with a paper towel after cooking and top with a dab of unsweetened applesauce for that authentic touch. In this season of wonder & magic we hope your holidays are merry and wish you a New Year filled with joy, peace and lots of treats!